NEW YORK: With pink hair and tattoos across her shoulders and neck, U.S. toymaker Mattel's latest collector's edition Barbie doll could be compared more to the edgy female heroine of author Stieg Larrson's best-selling Millennium trilogy than to the more traditional Barbies. Since its release earlier this month online, the $50 (31 pound) limited edition doll designed by Los Angeles-based fashion company tokidoki and aimed at adult collectors, has sold out but not before causing controversy. 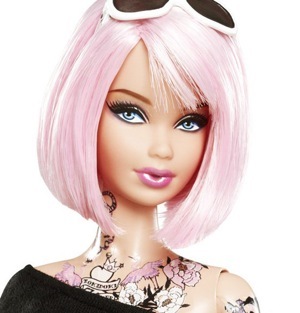 "Is the New 'Tokidoki' Tattoo Barbie Inappropriate for Children?" the magazine U.S. News & World Report asked in a recent headline. Some parents in the United States also questioned whether the toy company that launched the original Barbie in 1959 should be promoting body art. "It's teaching kids to want tattoos before they are old enough to dress like that," Kevin Buckner, of Virginia, told a local television station. No one was available from Mattel to comment on the issue but not all the feedback has been negative. Some adults said the doll reflected modern fashion and pop culture. "Have you seen Lady Gaga, Nicki Minaj, Katy Perry, Rihanna?" Candace Caswell, a 30-year-old mother from New York asked in an email interview, adding that the pop stars have tattoos and wear wigs and crazy clothes. "They are capturing a snapshot of pop culture the way it really is. Barbie is not raising my daughter. I am," she added. For Heather Gately Stoll, of Colorado, tattoos are not the issue. "What is inappropriate for kids are her measurements," she said about the shapely doll. "If she can change personalities why can't she change her shape and size?" And while New York mother Sue Dennis would not spend $50 on the doll, she is not offended by it. "I have a 16 month-old son and the tokidoki Barbie is more the diverse image of women I would like to present to him versus more traditional ones," she said. The tokidoki Barbie is not the first to sport tattoos. In 2009, some stores pulled Mattel's Totally Stylin' Tattoos Barbie following complaints, and a year earlier Mattel collaborated with motorcycle manufacturer Harley Davidson to produce a Barbie with wings tattooed on her back. Production of tattooed Butterfly Art Barbie was halted in 1999 after parents voiced their concerns. Gayatri Bhalla, 41, of Washington D.C, who writes a blog about experiences for tween girls, sees it as a marketing issue. "One the one hand, the company likes to hold Barbie up as the iconic American toy for girls and use her to promote things that most parents wouldn't object to, such as Take Your Daughter To Work Day," she said.